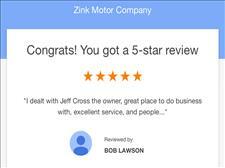 "I dealt with Jeff Cross the owner, great place to do business with, excellent service, and people..."
A great big thank you to Zink Motor Company for standing behind their product and caring about their customers in a day and age where so many don't. 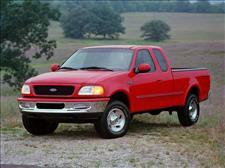 As a foster family with 5 children, we desperately needed our 3rd row vehicle back in working order. Thank you for coming through and getting us back on the road. Service like your's is hard to come by these days and is greatly appreciated. 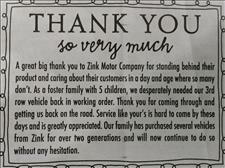 Our family has purchased several vehicles from Zink for over two generations and will now continue to do so without any hesitation. I can't tell you how nice it was doing business with you. 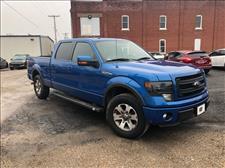 Of all the cars and trucks that I have purchased over the years, dealing with you was by far the best experience that I have had. I felt like I could trust your word, and that alone is invaluable. 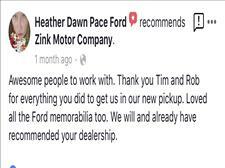 You will definitely be where I buy or sell my next vehicle, and I have already told many people about your dealership and how great you guys are to deal with. I know that I will be coming to see you again in the near future, and I look forward to it. I feel like I've not only met my new "car guy", but also made a new friend. I look forward to seeing you soon.